The Speed 30 is easily a best-of-show pack, with a light, clean design that incorporates a plastic frame sheet combined with a single aluminum stay to make this a genuine framed pack. We can debate the merits of using a framed pack for light-to-medium weight loads; the frame adds weight, of course, and at some point it seems likely that a frameless design is more efficient. The backcountry skier, however, is likely to encounter situations, even when day-tripping, in which they need to put a lot of weight on their backs. It's nice to have a frame when you're climbing up a steep gully via crampons and axe. In this situation, the Speed 30 excels, offering just enough suspension—and tool attachments—to comfortably carry skis and gear. I remain astonished at how well the Speed 30 carries weight. Its small size combines with its very stiff frame to absolute nail the load onto your hips, with almost no backward torquing whatsoever. On the descent, the Speed 30's minimal size allows the pack to vanish. It does not sway or flop around. Keep in mind that the Speed 30 was not designed as a ski mountaineering pack. Your skis edges will probably carve up the Speed 30's slender silnylon sides after a few seasons, so be prepared to replace this pack over time. Of course, non-skiers will have no such durability worries. Particularly if you're into epic-sized day hikes, you'll love the Speed's ability to carry big loads, including extra food and water. Though it does not employ mesh, the Speed scores well for breathability, thanks to its channeled backpanel, small size, and lightweight fabric. Can the Speed 30 serve as an overnight pack? I'll give a guarded yes: if you're a devout practictioner of true ultralight overnighting, and you know how to pack everything into 30 liters or less. 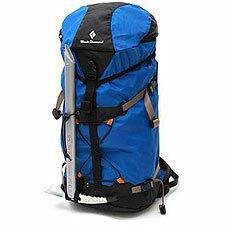 Of course, most of those folks like to use little more than stuff sacks and shoe strings as packs. Whether you're looking for a technical daypack to carry all your climbing hardware, a lightweight racing pack for hitting the trail, or a framed daypack that can carry heavy loads, you'll have a hard time finding a more versatile, effective little workhorse than the Speed 30. I haven't found better.